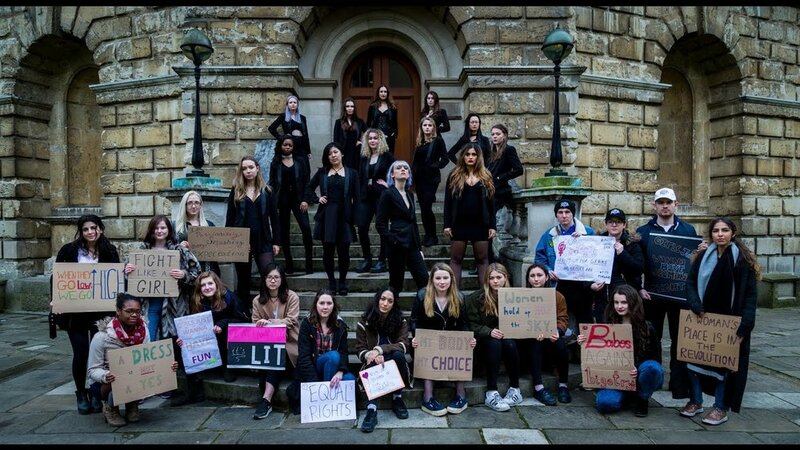 Founded in 1995 by a member of the Virginia Belles, the Oxford Belles - Oxford’s original all female a capella group - have been challenging the city’s male dominated music scene ever since. Last week I met with Miranda, Bethan and Katie – respectively the Musical Director and Co-Presidents of the Oxford Belles. Although the Belles believe the message of feminism has always been present within the group, as they’ve always performed all female songs, it’s something they are now reflecting on and bringing it to the forefront – as seen with their new EP Women of Note, as well as their show last August at the Edinburgh Fringe Festival. I first heard about the Belles with your music video ‘Girls Just Want To Have Fundamental Rights’ in 2017. Can you tell me about the inspiration behind the video? The 2017 Belles decided to do a video for International Women’s Day. They thought it would be a good idea to gather female academics from Oxford, do a pun on this song (which is actually not a very feminist song at all! ), and make this video all about female empowerment. They wanted to explore what it is to be a female academic in Oxford, the struggles they had to go through, and the type of oppression they faced, covering the bases of intersectional feminism. You just released a new album, Women of Note – what was the inspiration behind the album and the song choices? As we didn’t do a music video last year we decided to do an album instead – yet another project with a pun in the title! All songs in the album are written by women, and they all aim to shine light on women’s achievements. Not only did these female artists write inspirational songs, they also did it at a time when the industry was dominated by men, and they each add a unique take. Songs like ‘Noughties Queens’ (a mashup of Britney Spears, TLC, Jamelia, Destiny’s Child, Miley Cyrus and more) are ones that when we would dance to when we were younger, women’s songs that have guided us into becoming the women that we are now, and we think that’s a really great journey. The album was also foreseeing our Edinburgh show, which was inspired by the 100-year anniversary of the Representation of the People Act. Our show traced the paths women over the past 100 years who have paved the way for our feminism today, beginning with Ethel Smith and songs the suffragettes used to sing, going up to Aretha Franklin. For us the most powerful song from the show was our arrangement of ‘You Don’t Hold Us Down’. That was our protest song, underlining the oppression women have faced over the years. So what did it feel like to perform at the Edinburgh Fringe Festival? Exhausting! We did 8 shows – which actually isn’t that many, most people go there for a month. It was incredibly intense and amazing, we were all living together for ten days – so it involved a lot of laughter and a lot of tears. Because the show we were doing was a 40 to 50-minute show tracing 100 years of history, it was quite draining but empowering at the same time, allowing us to inspire people through a capella. Why a capella? Why is this the best method for spreading the feminist message? Collectivity – that was the theme of the show. The whole point of a capella is that we can’t create anything without each individual voice. Women coming together, working together with their own unique voices – this is what we look for in the new Belles. It has to be collaborative so we can create something we are proud of. In a way, a capella represents how women have come together throughout history - they wouldn’t have been able to face many of the challenges they did without each other. At the Fringe we were standing on the doors to thank people for coming, and one day a woman came up to us saying that when she saw the title of the show initially, her first thought was that a capella and feminism didn’t really go together. But after the show she realised that it’s not just about the medium, it’s the fact that it’s any medium: any way we can get this message of equality and respect out is powerful and important. It’s now the beginning of a new year – what are your projects for the future? This term we’re doing all new arrangements, aside from our one Christmas arrangement and the classic ‘Independent Women’. We’re hoping to take the girls up to the Fringe again next summer, although we’re still deciding on the show –it will definitely be feminist-themed, of course. We’re currently doing an arrangement of ‘What About Us’ by the Saturdays with a very feminist twist on it. Although it is a song about female empowerment, we’re taking it a step further by doing it all-girls, without the male voices in it. We’re hoping to maybe do a video of that next term, and also do a few live sessions of our rehearsals to show how we work together. We also had a segment in our Edinburgh show where each of us girls between songs would step forward and say part of speeches from inspirational women, such as Simone de Beauvoir, Malala Yousafzai, Gloria Steinem, Hillary Clinton, Oprah, Chimamanda Ngozi Adichie. We explored sexism in this way, wanting to educate our audience. We very much wanted to welcome men and non-binary people to our show, wanted everyone to come out feeling empowered and supporting a cause that benefits everybody. We’re hoping to reproduce this around Oxford, to spread the message around town, hoping that people leave our show knowing a little more. Could you tell me a bit more about your work with the Malala Fund? We’ve been working with the Malala Fund throughout all of last year and we are still raising money for it now. The charity aims to put girls through 12 years of safe education. All the profits we made from our show and our EP have been donated to the Malala Fund. In total we raised £1,167.35. This is insane, it felt so good to know we had inspired people to that level. We want it to be a continuing project as it’s something that’s really important to us. And finally - what is the Belles’ feminist anthem of choice at the moment? The first one would be ‘Six’, the closing song of the new musical Six, which tells the story Henry VIII’s wives - taking back ‘history’ and making it ‘herstory’. The last song of this show is an anthem for all of us – reinforcing the idea that we wouldn’t be anywhere without each other. Destiny’s Child’s ‘Independent Women’ is also a timeless song for the Belles, we teach it to every new Belle recruit – simply because it’s about women being independent and loving it. The Oxford Belles will be performing on November 17th & 18th at Oxford’s Christmas Lights Festival. Their EP ‘Women of Note’ is available on Spotify. Special thanks to Katie Medd, Miranda Bardsley and Bethan Savage for organising this interview.